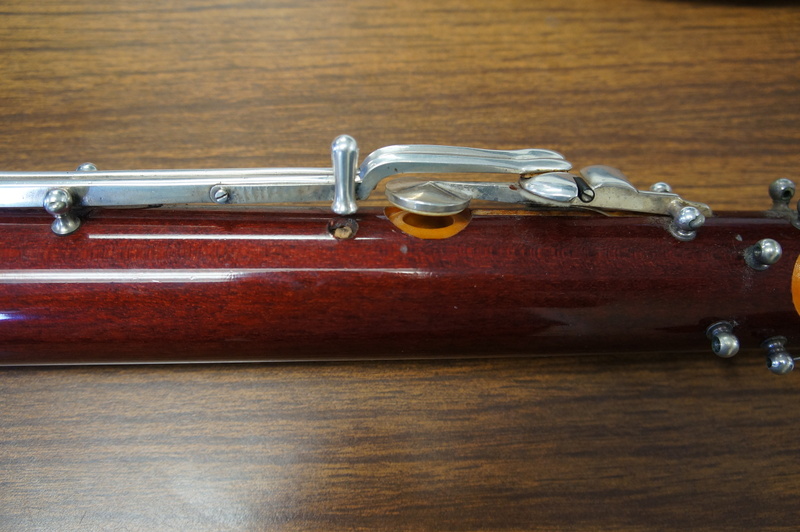 I sometimes run across bassoons with unusual or rare keywork features. 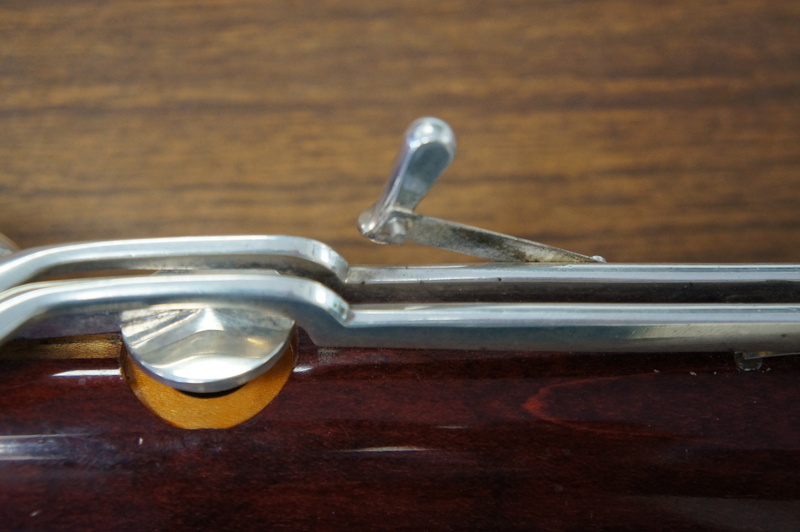 Sometimes I’m amazed at how clever instrument makers are at coming up with solutions to problems with the bassoon fingerings. Sometimes it takes me a while to figure out how the mechanism works and how it’s used. I’m almost never permanently stumped on a key, I can usually figure out the weird things. 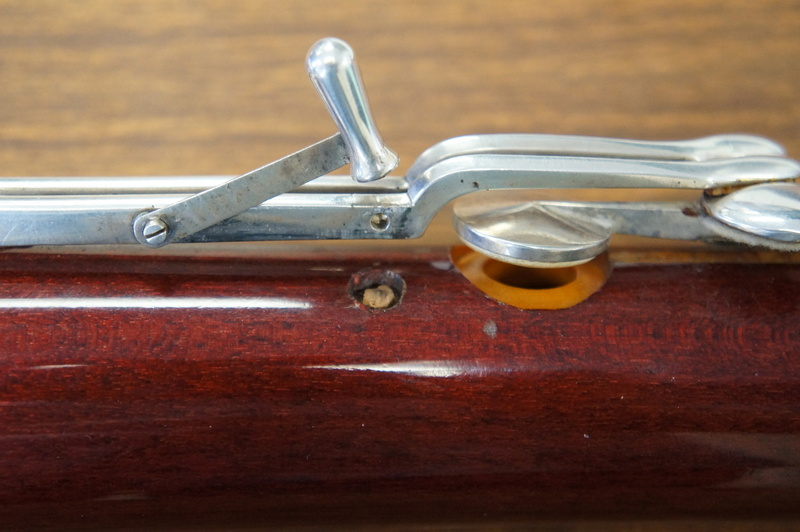 A small tab inserts into a hole drilled in the B natural lever that locks this little stub in place. If you flex the arm of the button, you can get the little tab to fit under the B natural lever. This would seem to cause the stub to encounter a bit of cork at the body of the bassoon. At the moment this does not impede the travel of the B natural lever. The other side of the stub shows the little tab. You can see the hole the stub locks into on the B natural lever, and clearly see the indent cut into the wood where a bit of cork is. Anybody know what it’s for? It doesn’t seem to do anything right now, so it’s probably missing cork or something. I mean, it appears to function to limit how closed the low B key gets, but I can’t figure out a reason why you’d want a mechanism specifically designed for that, especially one that’s so cumbersome to undo. The holes are differently from the main body of the instrument When the 315 is engaged in one of the holes the underside of stop member 311 is approximately flush with that of lever 310 and the stop member is inoperative. 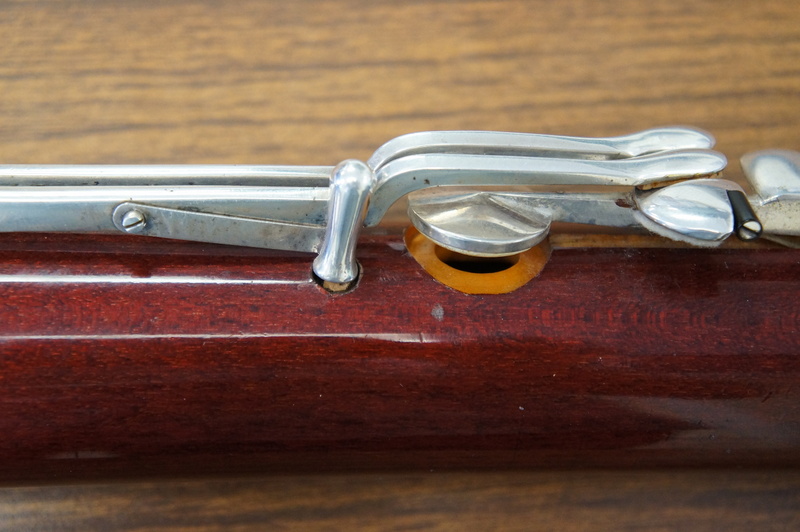 When pin 315 engages the other hole the stop member projects downward from the lever and prevents the stoppers the B C and D keys from approaching the corresponding tone holes more closely than approximately 1/32 – 1/32 inch and the desired mellow E sound can be produced. So I was right, it’s meant to mute those keys. Specifically for low E. So, a little button just for the first note of Tchaik 6. Why did you give the answer???? I actually figured out what it was for. Joelle taught me the same trick using the good old left thumb. Because I have a left pinky whisper key, I can (and have) muted a few notes by partially closing the low C key. My undergraduate teacher would put a piece of folded paper in specific places to mute keys for things like this. Never thought to actually modify the instrument in such a way just for one note played in one way (really for just one piece even).